By holding a giant magnet to your head, you can literally turn off parts of your brain. Not only will this make getting high potentially a lot cheaper for millions of college students, it could also become a very useful weapon in the right hands. A journalist for UK paper The Daily Telegraph filmed himself having the speech centers of his brain shut down while he recited a nursery rhyme — the results, which you can see below, are truly creepy. He literally starts stuttering and ceases to be able to form words for a few seconds in the middle of a sentence. Imagine if you could use this magnet to shut off the parts of people's brains that allowed them to think logically, or to turn on the reward system so that they felt really great every time they killed somebody for your evil organization. Seriously disturbing stuff. 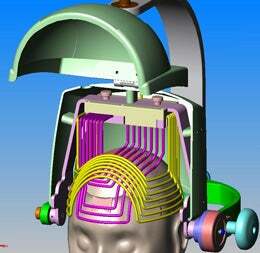 The first practical demonstration of TMS was made 23 years ago by Prof Anthony Barker at the University of Sheffield. Since then, it has become a relatively simple, non-invasive, and painless way to interfere with the workings of the brain, though there is a risk of epilepsy. Many scientists now use it for basic research. Some have used it to induce electrical changes in the brain's temporal lobes, which have been linked with religious belief, because some sufferers of temporal lobe epilepsy seem to experience hallucinations that bear a striking resemblance to mystical experiences of holy figures. Many doctors believe it has a role in helping a damaged brain to heal. TMS offers a kinder alternative to electroconvulsive therapy, the treatment of last resort for people with severe depression who do not respond to drugs. Others have used it to treat severe epilepsy, and there are efforts to use it to quieten the voices heard by schizophrenics and to track nerve development in infants. A few even believe that it could actually enhance cognitive skills.